Are you a coffee lover? Or a tea drinker? Or maybe you are a kind of person who drinks both coffee and tea? Maybe some of your housemates prefer only one of these drinks? If it is so then you don’t have to search for a gadget both for coffee and tea making for Cuisinart had developed it especially for you! What is it? It’s CHW-14 ― thermal programmable coffeemaker and hot water system. How does it work? Let’s find it out right now. 2 What does it have? On the coffee side. Cuisinart is an American brand that was founded in the 1971 and that has a great variety of kitchen equipment for houses now. Those are not only coffee makers but also bakewares, food processors, mixers, grills and so on. 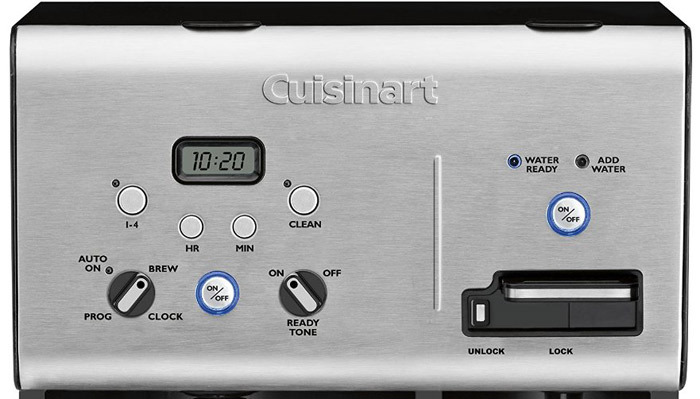 Since its very beginning, Cuisinart had possessed itself as a bringer of the easy cooking in every home. Well, we guess, they have done that perfectly. Cuisinart CHW-14 is a system constructed for both coffee brewing and tea making and for doing this it has two separate thermal blocks: one for coffee brewing with the special tank for the water and the other ― for tea or any other hot drink preparing. What does it mean? It means that you can brew your coffee and make a cup of tea simultaneously. And that’s really great. Well, let’s look closer over the gadget and find out pros and cons for the system. First of all, let us mention that if you are an espresso or cappuccino lover ― pass yourself by. This coffee maker can brew only regular coffee according to to the filter system; it has no pump and can’t produce pressure enough for espresso brewing. What does it have? On the coffee side. 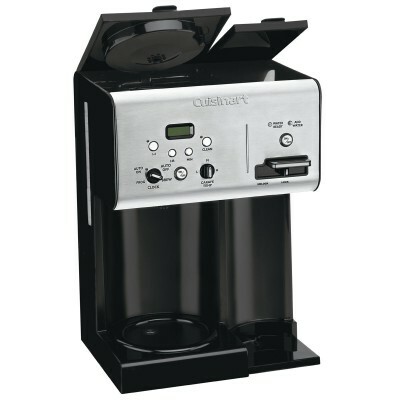 Cuisinart CHW-14 Coffee Plus works with paper or permanent filters which you will have to insert into the filter holder before filling it with ground coffee. Note that maximum capacity of filter basket is no more than 15 tablespoons of ground coffee. The unique fully programmable interface will allow getting your cup of coffee exactly in time you will set (you can choose any time of 24 hours). Also, you can switch between the programmable modes and choose if you want to brew coffee right now or at the time you have set. If you started to brew but don’t want to wait when it will be made full, you can switch the pause mode and get your cup before the machine will go one. You can also switch between the brewing mode: interface will allow you to choose how many cups you want to brew. If it’s less than 5 cups then you can just push the button to point this. The interface is user-friendly and you will get how it works very soon. That’s perfect for those people who are scared of programmable features and who feel uneasy making the settings. The system will switch on and off automatically; it also has a self-cleaning function and on/off the tone that will tell you if your brewing cycle is over (by beeping 5 times). If you hate when your kitchen gadgets beeping every time then you can switch this tone mode off. 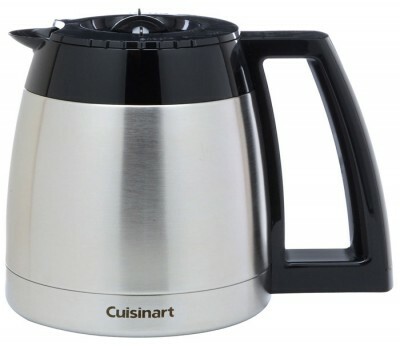 Cuisinart had divided its gadget into two parts for coffee and hot water making. Coffee part of the CHW-14 has the great carafe of stainless steel with drip-free pour spout and rather large and very comfortable handle. The handle size helps you to keep your knuckles away from hot carafe body avoiding the burns. Carafe also has a volume to prepare 14 cups of regular coffee, so you can see that it’s rather large and you won’t be concerned that it overflow when the brewing cycle is over. The coffee water reservoir has an impressive volume (56 oz) and allows to brew over 10 cups of coffee. It has a water level indicator so you won’t be mistaken by filling it. BUT. It is not removable: that’s unpleasant. To fill it you will always need some vessel to pour the water. Water level indicator is located on the side of the coffee maker, that’s why you will have to turn your gadget to watch the water level. That is also unpleasant, but of course, better then it wasn’t indicator at all. On the coffee side, that’s all now let’s go to the hot water part and watch what we have there. Actually, it’s not a tea side, it’s hot water side. Here you can dispense a hot water for any hot drink or soup you like. You only have to fill the separate water tank, wait a while and push the slider. The interface of this part has less functionality but still rather useful. Water tank as in the case with coffee maker is not removable. It’s smaller than water reservoir of coffee part of the gadget, has no outer indicator. You can see the water level while filling it, because it’s marked inside, under the tank cover. When the water level is a low special indicator on the interface will light it up, so you’ll be able to refill it instantly. Well, it has very simple function kit. These are two light indicators which show you if the water level in the reservoir is too low, and if the water is heated and can be dispensed. It also has on/off button, lock system and dispenser. The lock system is a slider ― very handful thing if you don’t want the dispenser to be pushed. You just turn the lock aside and it blocks the dispenser button. The drip tray is removable. It means that there is enough space even for tall travel mugs. Well, and that’s all about hot water part of Cuisinart CHW-14 Coffee Plus. Below we will give some technical specifications but firstly will mention about the warranty. Actually, Cuisinart gives 3 years warranty on each its gadget, but those were cases when the company refused in taking the broken product without any explanation That’s why be ready that the quarrel is possible. 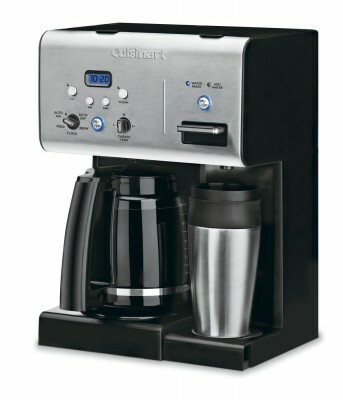 Cuisinart CHW-14 Coffee Plus is a perfect thing for the home where there are both coffee and tea drinkers. It’s absolutely useless in small houses because it is rather large for them. There are some uncomfortable features that you have to notice before purchasing it. Be ready to find some problems with water tank filling and filter changing.